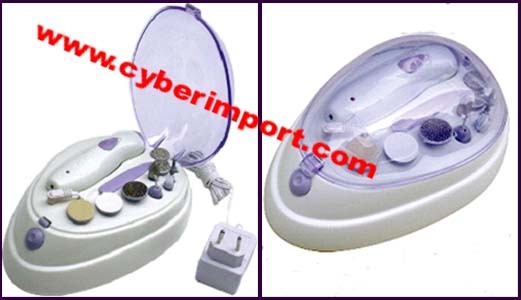 OUR ONLINE CATALOG and this manicure pedicure rechargeable electric set page serve as a cross-section of our China exports. Greater variety is available. Email us a photo example of what you seek. Export prices often change. All are re confirmed after your inquiry. You will be emailed a pro-forma invoice offer. 1. Hand unit for accu and direct drive, 2. Bubble bath for preparing hands with nozzles..
3. To let the water sparkle. , 4. With nail dryer. 6. Control light, no overcharging possible..
7. 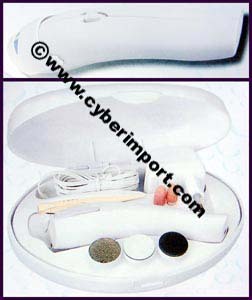 Convenient organizer box with charging station..
2.Sturdy molded plastic carry case. 3.AC/DC operated. With adaptor for charge: AC 100-240V / DC 3V. 4.LED charge indicator.. 5.With 2 speed control. 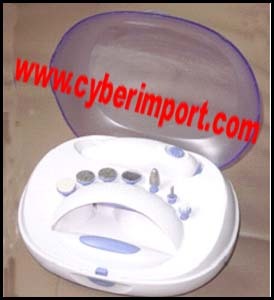 6.With 9 attachments: 3 conic limes, 2 fine shaping disk, 2 rough shaping disk, 1 polishing disk, 1 cuticle lifter. . 7.Rechargeable battery: 2x1.2VAA Ni-cd. 600mA or Ni-MH..
$ 7.02 /PC(Without RoHS) ,$ 7.54/PC (With RoHS) . 1.With dryer..2 AC/DC operated. 3.With 2 speed control. 4.With adaptor for charge.
. 5 .With 11 attachnents : Fine shaping disc, Coarse shaping disc, Fine smoothing disc, Coarse smoothing disc, Polishing disc, Thin pointed stone, Thick pointed stone, Grain cone, Cuticle unit, Small brush, Cuticle remover. 6.Rechargeable battery: Ni-cd AA 600mA 2.4V. or Ni-MH. Without UV: $7.78/PC. (W/O RoHS), $8.13/PC. (W/I RoHS) With UV: USD 8.84/pc. (W/O RoHS) , $ 9.08/pc. (W/I RoHS) 1. 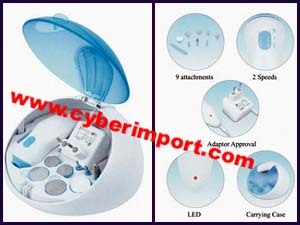 Professional nail care kit: For toe and finger nails and for treatment of hard skin. 2. Built-in nail dryer. 3.With clockwise / counter-clockwise rotation. 4. AC/DC operated. With adaptor for charge: AC 100-240V / DC 3V. 5.LED charge indicator.6. Sturdy molded plastic carry case. 7. With 2 speed control (4000RPM & 6500RPM). And FF/RF function. 10. Rechargeable battery: 2x1.2V AA Ni-cd. Or Ni-MH 600mA. 11. UV lamp rapid drying feature for option. 1. 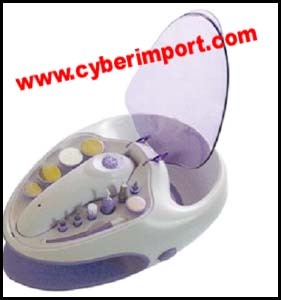 Professional manicure and pedicure set. 2. Easy to use ergonomic design. 3. Unit body operated by battery 2 x1.5V AA. 4. 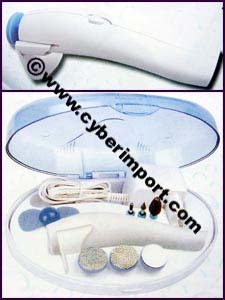 Built-in nail dryer operated by 4x1.5V AA. 2. Built-in nail dryer. 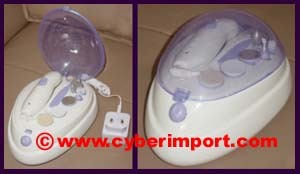 UV lamp rapid drying feature for option..
3. AC/DC operated. With adaptor for charge: AC 100-240V/DC 3V. 4. LED charge indicator.5. With 2 speed control (4000RPM & 6500RPM). 6. Motor driving torque: 80gfcm. 9. Built-in rechargeable battery: 2x1.2V AA Ni-cd. Or Ni-MH 600mA. 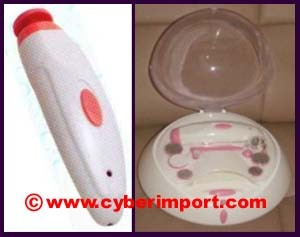 China Factory Minimum Quantity of these manicure pedicure rechargeable electric set items can be negotiated with factories. Dollar Amount is often more important to smaller factories than the quantity of each piece. 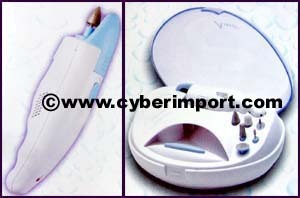 Minimum quantity often can be divided among several manicure pedicure rechargeable electric set or stock numbers. Please inquire with us about your specific needs for smaller quantities than those listed. Smaller quantity can result in a bit higher price. Ask us for a quote. Custom Orders are possible with any of our manicure pedicure rechargeable electric set products. Send us a .jpg example of what you want. If we don't have it, we can get it.